Americans produce enough waste each year to cover 1,000 acres of land 400 feet high with garbage. To bring that figure into focus, I did a little extracurricular math. In one year, the US creates enough waste to cover every single Sycamore property 44 times with one foot of trash. There are people who’ve understood that figure as a personal challenge to produce zero waste. Lauren Singer, a 26 year old New Yorker, produces so little trash that she can fit a year’s worth of garbage into a mason jar. In 2016 environmental activist, Rob Greenfield, wore every piece of trash he created in a month to highlight the 4.4lbs of garbage Americans produce each day. In lieu of wearing a human garbage suit, and considering most of us won’t go zero waste tomorrow, there are still several simple changes we can make to reduce our waste production and save acres of land from becoming landfills. Recycling Refresher: Knowing what your local recycling center takes verses what the curbside programs collect can help prevent contaminating a whole batch of recycling. Keep your recyclables out of the landfill by printing out these graphics (coming soon) to help you sort your recyclables in Bloomington. Bonus points for printing on recycled paper. Mealtime Matters: Much of our waste comes from throwaway items we use at one meal and toss. 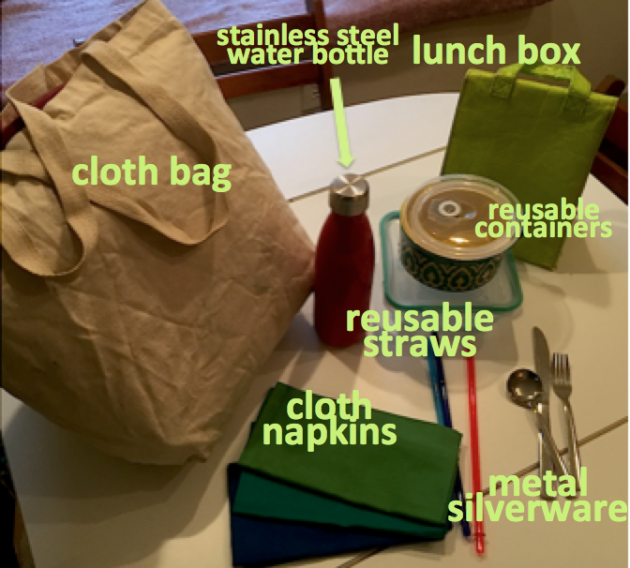 Reduce waste when you pack a lunch, go out to eat, or enjoy a meal at home by creating a zero-waste starter kit with these items. Cleanup Your Cleanup: New products are coming on the market that target the waste created by disposable cleaning products and wasteful cleaning routines. These cool products help to clean your house without creating dirty landfills elsewhere. Reusable paper towels that replace 6 months worth of paper waste, or cloth towels that snap together and fit on your paper towel holder. 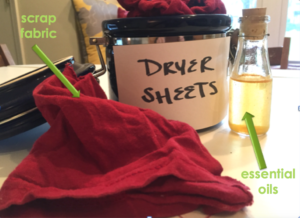 Replace dyer sheets with reusable dryer balls or make your own using old cloth and essential oils. Re-purpose old bed sheets and t-shirts for washable cleaning cloths. 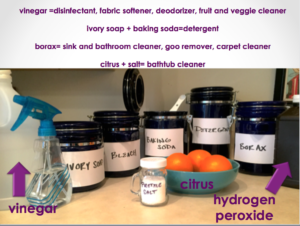 Make your own cleaning products using chemical-free ingredients that can be purchased in bulk, and store them in reusable sturdy containers. Some recycling is only cost effective on larger scales. Collect used school supplies like pens and markers and send them to TerraCycle, which will recycle them. 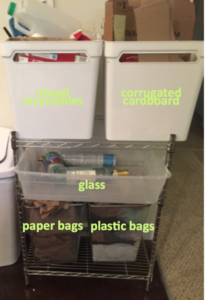 Help out friends who live in apartments and don’t have curbside collection, or those who don’t have cars and carpool to the Walnut Recycling Center. You don’t need to have your own compost bin to compost! Team up with friends who’ve already started composting and ask if they’ll let you add your food waste to their compost bin. 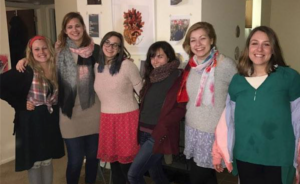 Organize a get-together to swap old clothes with friends instead of trashing them. Even if you can’t use it, someone else probably can! D.I. Why Not: The internet is full of posts from people who’ve created Do It Yourself projects to reduce waste…if you’re looking to DIY, chances are someone on the internet has a tutorial to guide you. Make your own cling wrap using this tutorial from Nourishing Joy. Construct your own composting bin using these 23 DIY Compost Bin Ideas from Backyard Growers as inspiration. Create your own plastic bag dryer to reuse you seal-able plastic bags. Use websites like Pinterest to help you brainstorm ideas to transform products instead of throwing them away. For example, typing “cereal boxes” into Pinterest will yield tons of DIY ideas to re-purpose empty boxes.